Frustrated Mess: Do I speak gently or harshly? Daily prompt for April 6th - Head to your favorite blog. Scroll down to the third post in the list. Take the third sentence in the post, and work it into a new post of your own. One of my new favorite blogs is dad;diagnosed and this post On Advocacy happened to be the third post down. The third sentence is "Do I speak gently or harshly?" I have to admit I cheated a bit and went to another blog first, but the sentence was about kidney pain. This second one I visited... what luck! 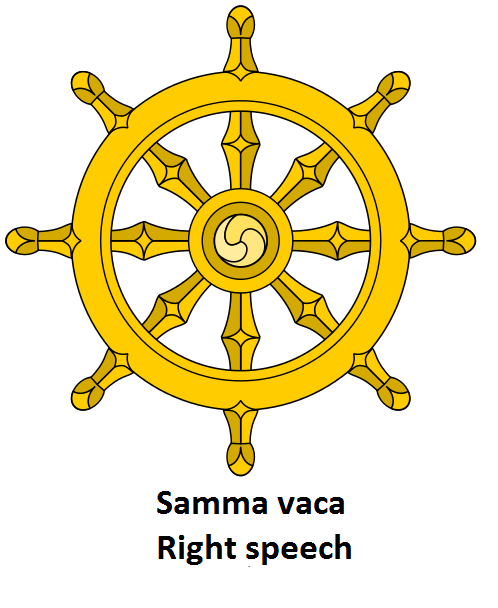 It's a quote from the Patimokkha specifically the samma vaca which is about "right speech" in Buddhism. 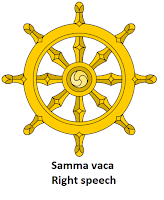 I don't claim to know a lot about Buddhism. I did take a course in eastern philosophy but that was a long time ago. But what an amazingly appropriate excerpt to quote relating to advocacy, the purpose of blogging, and reacting to comments. If you are interested in any of those things I encourage you to read the post! As a parent I always regret those times I speak harshly. I almost always wish I had spoke more gently. It never seems called for after the moment passes. Perhaps that's because as a depressive perfectionist I am constantly reviewing things I could have done better and beating myself up about it. In other words, I ruminate as a habit and probably blow things out of proportion as to how bad they really were. My reflections cannot be trusted. They are most likely out of touch with reality. Despite all that, I am confident that I have gone overboard at times. And haven't all parents? My mom told me she would sometimes pray at night for God to make us forget that day, that she had been too rough with us. I don't remember her that way so maybe God answered her prayers! It's easy to think that one should speak gently, but obviously takes a great deal of mindfulness to maintain that. It doesn't help when Phillip lashes out by swiping my glasses, slapping, or even biting. It can be extremely difficult to speak gently then. But dramatic reactions and harsh tones only end up encouraging him more. It has become an exercise in mindfulness to be aware that at any time he is capable of exploding at you, and to be prepared for how I will react. We talked to his therapist a few weeks ago and one of the things she simplified for us was that he is probably doing it because he wants something or wants to get out of something. Our goal must be to not let him get out of something if he behaves that way. We must pause and then continue what we were doing. It is hard!